Police reported 72,039 impaired driving incidents in 2015, a rate of 201 incidents per 100,000 population. Of the total number of incidents, 122 were cases of impaired driving causing death and 596 were cases of impaired driving causing bodily harm. The impaired driving rate steadily decreased from 1986—when comparable data were first collected—until the early 2000s. It then remained relatively stable until 2011, and has since declined. The impaired driving rate in 2015 was 65% lower than the rate in 1986 (577 incidents per 100,000 population) and 4% lower than the rate observed in 2014 (210 per 100,000 population). Among the police-reported impaired driving incidents in 2015, nearly 3,000 involved drug-impaired driving, including 7 incidents causing death and 19 causing bodily harm. In contrast to alcohol-impaired driving, the number of drug-impaired driving incidents has been rising since 2009, the year following legislative changes that led to the introduction of drug recognition experts (evaluating officers), and the year that data on the type of intoxicating substance began to be collected. Drug-impaired driving rose from 2% of all impaired driving incidents in 2009 to 4% in 2015. 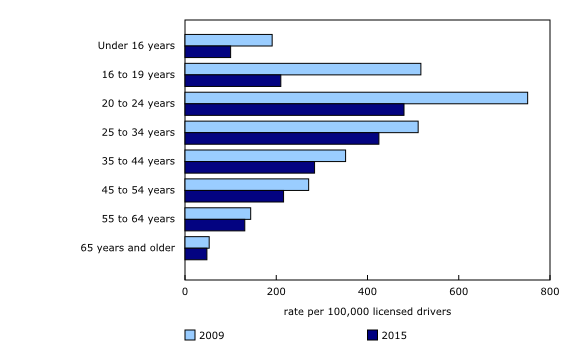 Based on self-reported data from the 2014 Canadian Community Health Survey (CCHS), available for Ontario, Manitoba, Alberta, Yukon and Nunavut, less than 1 in 20 drivers (4.3%) admitted to having driven, in the preceding 12 months, after consuming at least two drinks in the hour before getting behind the wheel. Although a relatively low number of drivers reported having driven after drinking, those who did reported that they had done so, on average, six times in the preceding 12 months. Drivers who reported drinking and driving more than once were responsible for 97% of self-reported drinking and driving incidents during the year. Moreover, at least one in six (16%) individuals accused of impaired driving in 2014/2015 had previously been accused of the same crime in the preceding 10 years. Among those accused of impaired driving causing bodily harm or death, one in five (20%) had been previously accused of impaired driving in the preceding 10 years. As with crime in general, Saskatchewan had the highest rate of police-reported impaired driving among the provinces in 2015. There were 575 incidents per 100,000 population, a rate nearly twice as high as Alberta's (314 per 100,000 population), the province with the second-highest rate. Saskatchewan (-37%) was also the province whose impaired driving rate has decreased the least since 1986. 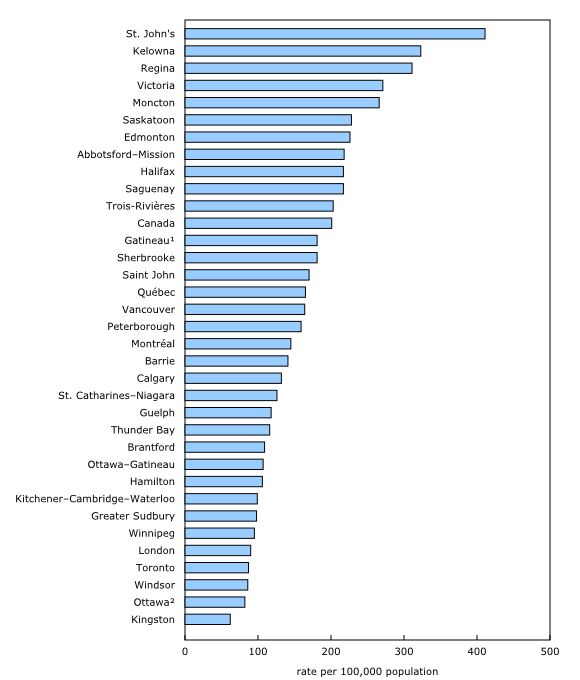 The Atlantic provinces, however, had the highest rates of police-reported drug-impaired driving. Newfoundland and Labrador (22.9 incidents per 100,000 population) had the highest rate, followed by Nova Scotia (20.7 per 100,000 population) and Prince Edward Island (15.0 per 100,000 population). Ontario had the lowest impaired driving rates in the country in 2015, for both impaired driving overall and drug-impaired driving specifically. Quebec was second lowest in both impaired driving overall and drug-impaired driving rates. Yukon and the Northwest Territories had much higher impaired driving rates than any province, while Nunavut (520 per 100,000 population) had an impaired driving rate closer to that of the provinces. Half of all police-reported impaired driving incidents in 2015 took place in one of the country's 33 census metropolitan areas (CMAs). This was lower than the proportion of Canadians who lived in a CMA during that same year (approximately 7 out of 10). Furthermore, relatively fewer impaired driving incidents causing death occurred in CMAs (just under one-third of all impaired driving incidents causing death). This contrast was even greater for the most populated CMAs. While Toronto, Montréal and Vancouver accounted for 35% of the Canadian population, together they reported 8% of impaired driving incidents causing death. The higher proportion of impaired driving incidents in regions outside a CMA could be traced to a number of factors. For example, the distances to travel are often longer and alternative transportation such as public transit is more limited. The availability of evaluating officers (drug recognition experts) may also be more limited in these areas. In addition, relatively more residents living in regions outside a CMA drive vehicles. Over three-quarters (77%) of CMA residents who participated in the 2014 CCHS reported driving a vehicle in the 12 months preceding the survey, compared with 87% of residents living in regions outside a CMA. Among those who drove a vehicle during the year, similar proportions admitted to having driven after drinking, whether or not they lived in a CMA. Almost half of all impaired driving incidents occur between 11:00 p.m. and 4:00 a.m. The number of police-reported impaired driving incidents fluctuates significantly both throughout the week and also by time of day. Nearly half of all incidents occurred on weekends, and relatively the same proportion took place between 11:00 p.m. and 4:00 a.m., with peaks between 2:00 a.m. and 3:00 a.m. from Friday night to Saturday, and Saturday night to Sunday. Nighttime was also the period with the largest decline in impaired driving in recent years. For the hours between 11:00 p.m. and 4:00 a.m., police reported almost 11,000 fewer incidents of impaired driving in 2015 than in 2009, representing 69% of the overall decline in impaired driving since 2009. Compared with alcohol-impaired driving, the number of drug-impaired driving incidents varied much less by time or day of the week. For example, 28% of drug-impaired driving incidents took place between 11:00 p.m. and 4:00 a.m.— virtually the same proportion that took place between 6:00 p.m. and 11:00 p.m. In 1998, a driver was charged under the Criminal Code in 9 out of 10 (89%) impaired driving incidents. By 2015, this had fallen to about 7 out of 10 impaired driving incidents (71%). Several factors may explain this decline. One factor is that police may sometimes deal with impaired driving incidents in accordance with provincial laws. For example, the proportion of incidents cleared by charge in British Columbia fell from 69% in 2009 to 27% in 2011 after the province adopted amendments to its Motor Vehicle Act. Drug-impaired driving incidents were less likely to be cleared by charge (59% in 2015) and required more time to be cleared (28% required more than 30 days versus 16% of alcohol-impaired driving incidents). Compared with alcohol-impaired driving incidents, drug-impaired driving incidents can be more complex since there is no clear limit and police must call on evaluating officers, whose expertise can be challenged in court. Drug-impaired driving incidents also take longer to resolve in the courts. In 2014/2015, the median time required to handle a drug-impaired driving case was 245 days, more than twice the median time required to process an alcohol-impaired driving case (114 days). Furthermore, drug-impaired driving cases were less likely to result in a guilty verdict (61% compared with 81%). The majority of individuals (80%) charged by police with impaired driving in 2015 were male, but the proportion of females (20%) has increased over the last three decades. Men (7.5%) were also more likely than women (0.8%) to report drinking and driving in 2014. Men were also more likely to have done so on several occasions, on average six times in the year preceding the survey, compared with four times for women. Men accused in an impaired driving court case in 2014/2015 were more likely than accused women to have already been charged with impaired driving in the previous 10 years, 17% compared with 11%. In contrast, men were responsible for most of the decrease in police-reported impaired driving incidents over the last 30 years. While the number of men charged with impaired driving has decreased by approximately 70% since 1986, the number of charged women has declined slightly. In 2015, women represented 20% of individuals charged with impaired driving, compared with 8% in 1986. In 2015, the highest police-reported impaired driving rate was among drivers aged 20 to 24, at 480 incidents per 100,000 drivers. According to the CCHS, however, drivers aged 25 to 34 were the most likely to report driving after drinking. The police-reported impaired driving rate for drivers aged 20 to 24 was 36% lower than the rate recorded in 2009, which was the second largest decline among all age groups, following drivers under 20 years of age. Some provinces, notably Ontario, Quebec, New Brunswick and Saskatchewan, recently extended zero tolerance for impaired driving to all young drivers, whether or not they are new drivers. Quebec and New Brunswick are the two provinces where the number of impaired driving incidents for drivers under 20 years of age decreased the most from 2009 to 2015. Several factors may explain the higher prevalence of impaired driving among young adults, including their drinking habits. Although individuals with a healthy lifestyle were generally less likely to report driving after drinking, playing sports—especially team sports—was the exception to this rule. Specifically, 7.3% of individuals who play a team sport reported driving after drinking in 2014, compared with 3.9% of inactive individuals. This proportion was also higher among individuals who play certain individual sports such as golf (10.0%), skiing or snowboarding (8.5%), fishing (7.9%) and bowling (7.1%). Drinking and driving could be associated with socialization, as indicated by the time and day of the week that police-reported impaired driving peaks were observed. Drivers and passengers could also have a certain influence on one another. For example, almost 1 in 10 individuals reported having been a passenger of a driver who had been drinking in 2014. Of these passengers, more than one-quarter also reported having driven a vehicle after drinking during that same year, and more than half (59%) of impaired drivers had also been passengers of an impaired driver at another time. The data in this article are primarily taken from two data sources: the Uniform Crime Reporting Survey (UCR) and the Canadian Community Health Survey (CCHS). Data from the UCR represent impaired driving incidents, as defined in the Criminal Code, which are reported to and substantiated by police. The CCHS is a household survey whose driving module was carried out in 2014 among a sample of residents of Ontario, Manitoba, Alberta, Yukon and Nunavut. Respondents were asked the following question: "In the past 12 months, have you driven a motor vehicle after having two or more drinks in the hour before you drove?," usually referred to in this article as "driving after drinking." The Juristat article "Impaired driving in Canada, 2015" (Catalogue number85-002-X), is now available.